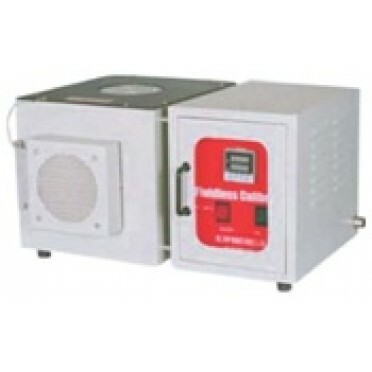 Temperature Calibrators have provided better way and made calibration a pleasant job. Fluidless Calibrators, essentially comprises of a metal block, electrically heated and precisionely controlled,using a microprocessor based PID Controller. The heated block is so well insulated and packed in a sheet metal housing, that even a highest operating temperature , the technician can work comfortably with them. They are provided with cooling fan for rapid cooling, should you want to take upwards and downward readings. These are, in short, highly stable heat sources, which are most suited for calibration of temperature sensors viz. Thermocouples / RTDs / Thermistors, Dial typeTemperature Gauges, Glass Thermometers, Thermostats etc. Standard Accessories : Instruction Manual, "Altop" Calibration Certificate. Power Supply 230 AC, 1 ˘, 50 Hzs.